What Is a Half Square Triangle Unit? Half square triangle units are squares made up of two 90 degree triangles. Each triangle occupies half of the square's space. 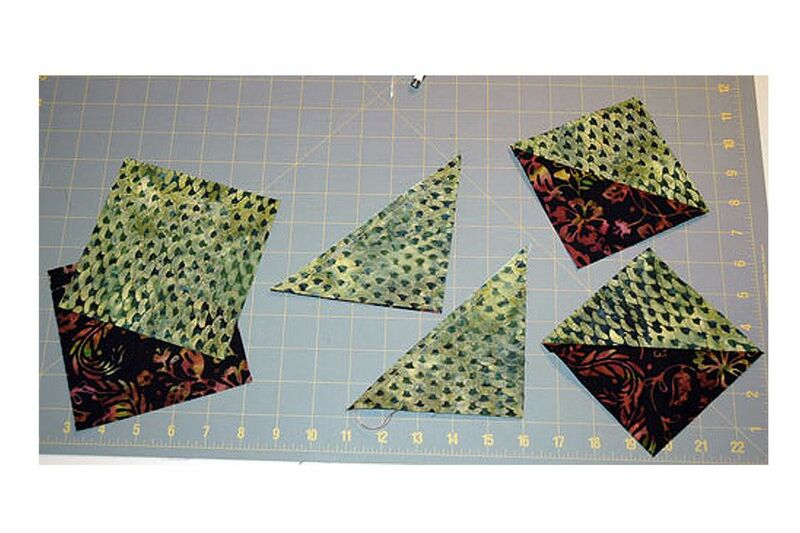 Quilters have developed many ways to make quick pieced half square triangle units. One favorite is this technique, where two squares of fabric are sewn together twice diagonally. When cut apart, the pair produces two identical HSTs. The method is a perfect technique to use when you're making a scrap quilt or need a few HST units in specific color combos. Try the Magic 8 half square triangle method to create eight units at one time. You might also want to try sewing half square triangle units on a long grid. No matter which method we use, we prefer to create oversize units and then cut them back to their exact unfinished size as explained on page 5. Refer to your quilt pattern for the triangle square size and number of units required. If you are drafting your own pattern, cut squares that are 7/8" larger than the finished size of the units (unless you prefer to create oversize HST units and then cut back for improved accuracy). When calculating, remember that each pair of squares produces two triangle square units. Use a pencil or permanent marker to draw a diagonal line from one corner to the opposite corner on the reverse side of the lightest square. If you do not have a quarter-inch presser foot, draw two more lines, each one 1/4" from the original diagonal line -- extra lines are not illustrated. When making small triangle-square units, try sewing seams a 'scant' 1/4" from the center line. In other words, a tiny bit closer to the center. Pair the marked square with a darker square of the same size, edges matched and right sides together. Secure patches with straight pins. Sew two seams, each 1/4" from the marked center line. Press as-is to set the seams. Use scissors or rotary cutting equipment to cut through both layers of the square on the marked center diagonal. Place the half square units on your ironing board, the side with the darkest fabric up. Open up one unit and press carefully, moving the iron into the seam that separates the dark half from the light half. Trim the "dog ears" from the ends of seam allowances -- the left unit in the illustration is trimmed, the right is not. Measure the units. They should be 1/2" wider and taller than their finished size. If units are too small, try sewing the next squares together with seams that are slightly less than 1/4" from the marked center line. Once you know your seams are accurate, speed up assembly time by chain piecing the squares. It takes longer to make oversize triangle square units and then trim them back to their exact, unfinished size before assembly. The extra time spent making precise units often results in time saved when all patchwork fits together exactly as it should. A square ruler with a line along its diagonal makes it easy to complete the trim-back steps. Add an extra 1/8" to 1/4" (depending on your comfort level) to the square size required for your units. Sew two squares together as explained on the previous pages. Cut apart and press. Grab your square rotary ruler and cutter. From the front side of the unit, align the ruler so that its diagonal line is lined up exactly with the diagonal line between fabrics (rule numbers will increase from right to left). Let a little bit of fabric extend past the top and right edge of the ruler, making sure that the left and bottom edges of the patch go a bit beyond the desired unfinished size of the HST. For instance, if your HST should measure 3-1/2" x 3-1/2", the left and bottom edges of the square should lie a bit beyond the rules for that dimension. Trim away the little bits of fabric along the top and right edges of the HST. Turn the HST around, placing its newly trimmed edges to the inside of the ruler, aligning them with the rules that indicate the correct size (such as 3-1/2"). Make sure the diagonal line is once again aligned with the seam between the patches. Trim the little bits that extend past the top and right edges. Your HST unit should now be 1/2" taller and wider than the finished size of the patchwork.